Owling is the mid-2011 trend or fad of posing as an owl - that is, crouching or squatting and looking pensive. The act is completed with a photographic record of the event - and a cool Owling t-shirt or other memento from our collection of originals. Forget planking - owling is the newest trend. If you like to pose like a wise old owl and take photos in interesting places, label yourself an OWLER and be done with it. Forget planking - owling is the newest trend. If you like to squat and look like a wise old owl, you belong in the official Owling Department. Forget planking - owling is the newest trend. Squat in odd places and take pictures, that's the thing. This funny seal proclaims you to be an "Official Owler" in the "Department of Squatting." A video game spoof design of a current trend: owling. 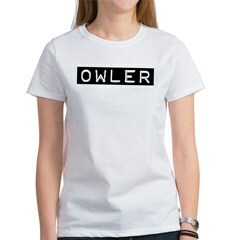 If you're into owling, this Content Rated: Owler design is for you.